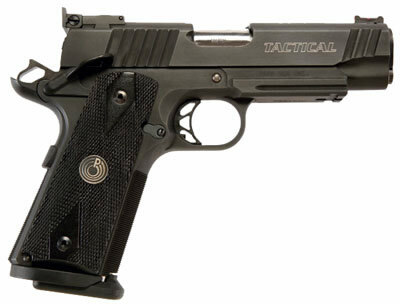 The ultimate in a compact tactical pistol equipped with a super strong integral light rail built into the dust shield. The front strap of the frame is checkered 30 lpi for improved gripping surface with or without gloves. The Match grade integral ramp 4.25-inch barrel is locked up at the muzzle with an Ed Brown National Match bushing. An Ed Brown slide stop completes the lockup with the link. Cylinder and Slide provides its Tactical II hammer, sear and disconnector for a clean crisp trigger. PARA's Power Extractor insures reliable extraction. A flat, checkered mainspring housing mates to the Ed Brown magazine well to funnel the 8-round PXT magazines with alloy base pads into the pistol.